Blinds will be 1/2 Inch less than the width shown. Save $$$ when you order by the case! Optional Add On - Hang your curtains with a standard curtain rod directly on your blinds with these optional brackets. Alabaster only. Custom Cut - Vinyl Blinds can be cut to exact widths and length. Enter your size in the box and select inside mount or outside mount. If you select Inside Mount, the blind will be 1/2" less in width than size entered which is the standard for blinds being mounted inside a window. This allows 1/4" clearance on each side so the blind can be raised and lowered and the slats have room to function. Select Outside Mount and your blind will be cut to that exact width. 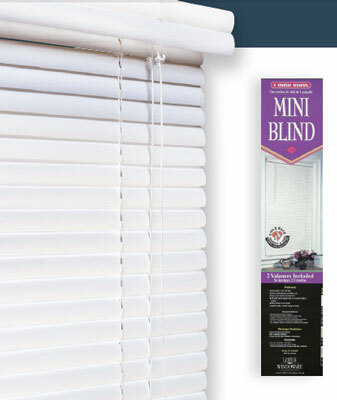 Width can be cut up to 5 1/2 inches Please note that custom cut vinyl mini blinds require an additional 2 weeks before shipping and cannot be returned. Please inspect blinds for damage before installing as original packaging is required for damage claims.